Soccer fans get really upset when players and coaches don’t shake hands with the other team. Remember the Wayne Bridge-John Terry incident, when romantic intrigue spilled onto the playing field? Remember the Rio Ferdinand-John Terry incident, when brotherly solidarity compelled Rio to eschew the traditional pre-match greeting? (It’s amazing how many players have spurned Terry’s outstretched hand.) And remember the days when, every time Manchester United played Liverpool, Fox would skip a commercial break in case Patrice Evra and Luis Suarez started slugging each other? The first #handshakegate of the new season comes from a surprising source: Pep Guardiola, the anti-Mourinho, the guy widely regarded as the classiest manager in European soccer. 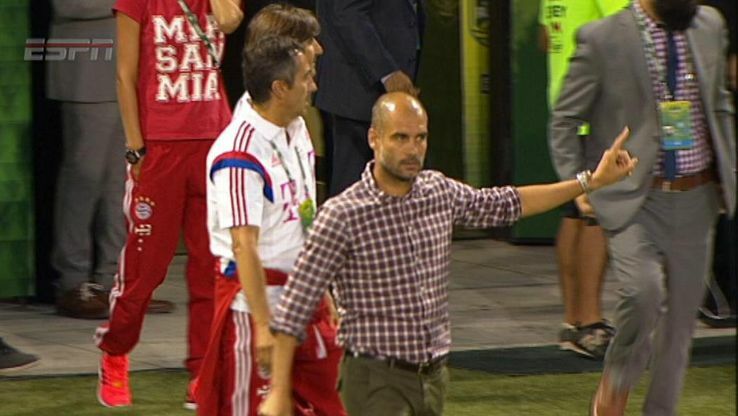 At the end of Wednesday’s MLS All-Star game, Guardiola refused to shake hands with MLS coach Caleb Porter, because he resented the All-Stars’ aggressive tackling. Cue the usual sanctimony. “Poor form from the Bayern coaching staff,” Grant Wahl tweeted. “You don’t deserve a Champions League,” added another user. Before long, #disgrace was trending. In other news, the Premier League’s new concussion protocol does not empower independent doctors to decide whether injured players should reenter the game. It’s time we started complaining about an actual disgrace.